Rise and shine with this organic breakfast on the go. The spicy kick of jalapenos will get you off to a great start! 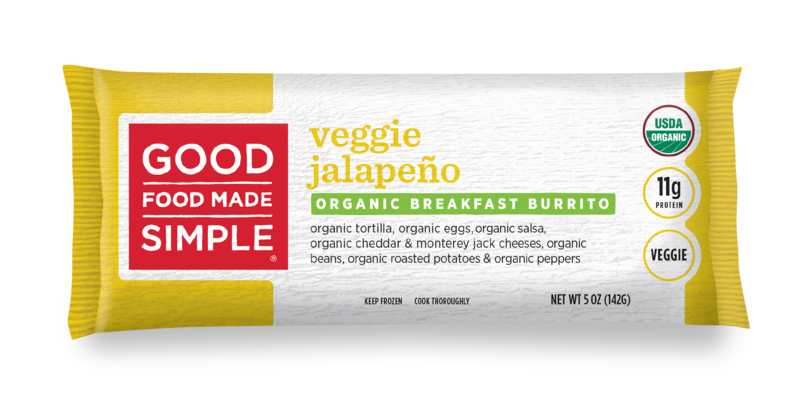 Made with organic eggs, organic salsa, organic cheddar & monterey jack cheeses, organic beans, organic roasted potatoes & organic peppers. EGG (ORGANIC WHOLE EGGS AND CITRIC ACID), ORGANIC SALSA (ORGANIC DICED TOMATOES, DICED ORGANIC ONIONS, ORGANIC VINEGAR, ORGANIC LIME JUICE, DICED ORGANIC JALAPENOS, ORGANIC SCALLIONS, SEA SALT, ORGANIC GARLIC POWDER, ORGANIC CILANTRO, ORGANIC CUMIN, ORGANIC BLACK PEPPER, ORGANIC CORIANDER, ORGANIC CHILI PEPPER, ORGANIC CORN STARCH), ORGANIC RUSSET POTATOES (ORGANIC POTATOES WITH ORGANIC OLIVE OIL), ORGANIC WHITE CHEDDAR CHEESE (PASTEURIZED ORGANIC MILK, CHEESE CULTURES, SALT, ENZYMES), ORGANIC WHITE KIDNEY BEANS, ORGANIC RED PEPPERS, ORGANIC GREEN PEPPERS, ORGANIC MONTEREY JACK CHEESE (PASTEURIZED ORGANIC MILK, CHEESE CULTURES, SALT, MICROBIAL ENZYMES, POWDERED CELLULOSE ADDED TO PREVENT CAKING), ORGANIC JALAPEÑOS, WATER, ORGANIC ONIONS, ORGANIC CORN STARCH, ORGANIC WHITE CHEDDAR CHEESE SAUCE (ORGANIC CORN STARCH, SALT, ORGANIC EVAPORATED CANE JUICE, ORGANIC NATURAL CHEDDAR CHEESE FLAVOR, AND 2% OR LESS ORGANIC CANOLA OIL).